Pigeons are actually domesticated rock doves that have returned to wild or semi-wild conditions. Some rock doves were domesticated for food, others as homing pigeons, and some as ‘fancy’ pigeons, bred for their plumage. Feral pigeons are a generally grey bird with slightly iridescent feathers on the neck that shine pink and green in the sunlight. Coloration is very variable with some individuals being white, others brownish-red, some grey and many mixtures. The eyes are orange and shine brightly in the sunlight. They average 3-5 years in the wild. Captive pigeons can live for 15 years but some have been known to live for up to 35 years. Pigeons feed on the ground in flocks or individually. They roost together in buildings or on walls or statues. When disturbed, a pigeon in a group will take off with a noisy clapping sound. This helps inform the other pigeons that there is danger present. If a pigeon is alone it will respond to danger by keeping very still and trying not to be noticed. Pigeons are excellent fliers and can reach speeds of up to 50mph. They are capable of rapid dives and changes in direction and most of the time will easily out manoeuvre a bird of prey such as a sparrowhawk. They are resident and do not migrate. Feral pigeons build their nests in or on buildings and other structures like bridges. Fouling of these structures is inevitable. This is not only unsightly but may also have destructive effects from feral pigeon droppings. Pavements, ladders and fire escapes may be made unsafe because of the real dangers posed by slippery bird excretion. Droppings also pose a significant hazard to pedestrians, particularly the elderly, as footpaths and stairways are made unsafe because of the potential for slipping on droppings. 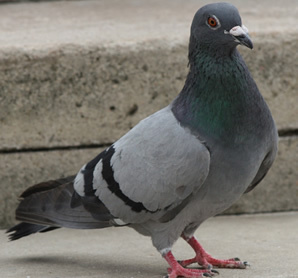 Feral pigeons also carry diseases that are harmful to man. Significantly more than the brown rat and yet we wouldn't think of feeding the rat. The best known disease passed from birds to man is Psittacosis but over 40 more diseases can be passed from the feral pigeon to humans. All the risks to ourselves and the damage to our buildings and heritage can be controlled with products from "Flock-Off".